Hyundai has just released its first specialised materials handler excavator onto the New Zealand market, and our sister site DealsOnWheels.co.nz went for a closer look as an R210W-9 settled in at a busy Hamilton scrap metal recycling yard. If Hyundai's new R210W-9 materials handler looks slightly familiar, that's because it is. 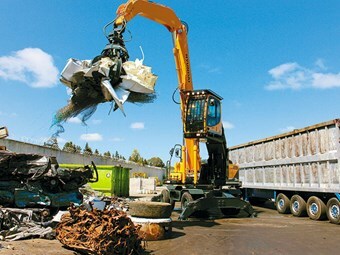 Despite being the Korean manufacturing giant's first entry into the scrap metal recycling market, the machine is part of Hyundai's 'World Excavator' blueprint, with the architecture and power pack of a Dash 9 wheeled excavator hidden underneath those heavy-duty outriggers and lift cab. "There's a heck of a lot of proven merit in this design," says Matthew White, business development manager at distributor Porter Equipment. "The main changes are the cab configuration, being a hydraulic lift unit, and the straight boom which provides for more reach and downforce. This is a new piece of kit within the wider Hyundai family, but it has been engineered on a solid foundation. "And being a Hyundai machine there has been a lot of research and development gone into making sure it's fit-for-purpose before being released to the public." The machine’s first NZ home is Hamilton's Global Metal Solutions, where managing director Craig Tuhoro has replaced a lease machine with the new R210W-9. "Grant, who operates the machine, loves it: he has a lot of experience on the job – over 25 years – and he's incredibly well-versed in what makes a good machine great," Tuhoro says. "At the end of the day I listen to the guys out in the yard; their feedback is vital to how the company operates day-to-day. So if I get someone raving about the capabilities of a machine, as Grant did after just a couple of weeks in the Hyundai, I'll definitely take note." Tuhoro also says that reliability is the key attribute for any piece of yard equipment and, when lifting one to two tonnes at reach while feeding something such as a slide loader, consistency and hardiness are paramount. The arrival of the materials handler also highlights another aspect of Hyundai's manufacturing operation: the heavy-duty grapple attached to the machine wears the Hyundai brand name too and was developed alongside the materials handler itself. White says Hyundai has been investing a lot of research and development into the attachments side of the business. For the New Zealand market, putting new machines like the R210W-9 to work in busy yards such as that at Global Metal Solutions is also something of a continuation of that R&D, allowing the distributor to gather immediate feedback from companies utilising the hardware. "At the end of the day, scrap metal is a target sector of the market and Hyundai's ability to adapt to this market without reinventing the wheel – and therefore keeping costs down for the end-user – is a real bonus for the industry," White says. Click here to find Hyundai rubber-tyred excavators for sale. Click here to look up rubber-tyred excavator specifications.